“Don’t Mess with Texas” is a familiar line in regards to the largest state. Killeen, TX is home to Fort Hood so I knew I had to bring my ‘A’ game in order to place in the MK5K in my nephew’s memory. Leave it to me to find a silver lining behind every cloud. I decided to find a race during the weekend of Lil Jay’s funeral. The Mary Kay Foundation is the largest financial contributor to provide help for domestic violence victims. The foundation also supports research for cancers which affect women. The race location was at the Killeen Community Center. The weather was overcast and 40°. This was summertime compared to the worse road conditions I have ever driven thanks to Storm Thor. I heard a lot of comments about “You must be fast” and “You can tell you’re a runner” because of my shorts. I made it known I was there run in memory of my nephew who would be laid to rest a few hours later. After a prayer lead by race director, Darlene Beckett, we were on our way. Two women took off like lightening bolts. I stayed relax and told myself to run my own race. After the first turn there was a nice hill up Veterans Memorial Blvd. This is where I passed Army Chick #2. We turned left by a Jack In The Box and Tatted Up Lady #1 was with in sight. The sidewalk curved back into the Community Center Park. I didn’t like the concrete paths, but I made the most of them by running tangents. We were at the half way mark, and I lengthened my stride to take 1st place female. I knew I had plenty of distance when Tatted Up Lady #1’s breathing was no longer in ear shot. My next mission was to pick off at least one of the 5 guys ahead of me. My target was dressed in all green. I nicknamed him “Shamrock.” Dude started walking and I caught up with him. He tried to pass me but I left him feeling green. I kicked hard to the finish line and earned 1st place female overall and 5th place overall out of a field of approximately 70 runners. My time was 23:08. The race director was excited to have a participant all the way from Louisville, Kentucky. They all showed a lot of love. The previous two year’s winner placed 4th so it was a major upset for her. I must also mention I was the oldest out of the top 7 finishers. The race swag was the best I’ve ever seen for a 5K. They gave out reusable Army totes with keychains, pens, water bottles, Texas Roadhouse peanuts, tech shirts, note pads, and natural beauty samples from Tetyana Naturals. My first place finish earned me a trophy, $75 worth of gift certificates, and a nice sweatshirt from Field House Gym. This was in addition to the $25 worth of gift certificates I won as a door prize. Well done Dazzling Dream Team of Mary Kay! Thanks for being that silver lining behind the clouds. 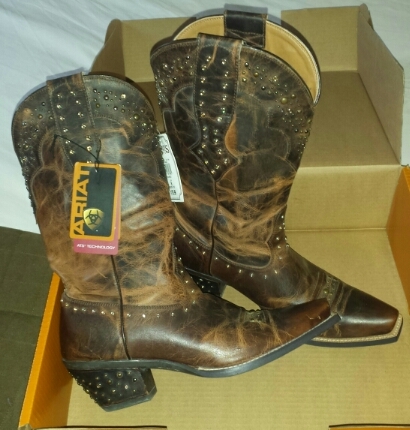 Lastly, I wasn’t leaving Texas with out a pair of Cowgirl boots! 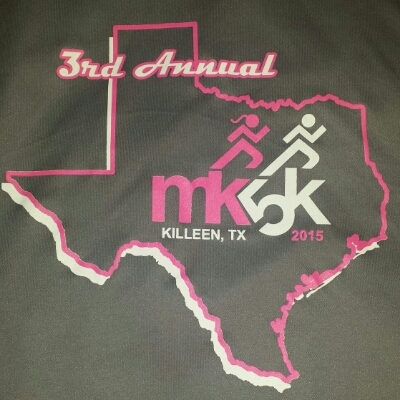 This entry was posted in family, running, Travel and tagged killeen, mk5k, texas. Bookmark the permalink. Thanks for sharing this sweet and inspiring tribute to Lil Jay. And you won to boot…Congratulations!! Thank you Aunt J! I love you! Sorry to hear about your nephew. Nice job in the race!!! I wish I knew you were in Texas, we could’ve tried to meet up!!! Thanks Scott! I thought about ya. Some tacos would’ve been great! Holla at me next time! “Shamrock” eh, that was a great run in honor of your nephew. I look forward to returning the green if your ever in Kilkenn/ ft hood/ temple area again! What a wonderful way to remember your nephew, and congrats on your accomplishment.